Comments: By the 1870s, populations of Common Terns were decimated by the millinery trade but rebounded in the 1930s due to protection brought about by the Migratory Bird Treaty Act. However, they fell again when the effects of DDT and competition with gulls for limited breeding sites affected their breeding opportunities and success. Common Terns usually nest on islands in open areas with sand, shell or gravel and some vegetation for chicks to use as shelter. They are rare local breeders in the northern Great Plains, but they migrate through the region and are often found on lakes and reservoirs. They are most likely to be confused with Forster’s Terns. 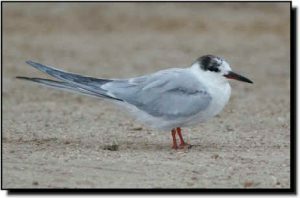 However, Common Terns are slightly smaller with shorter legs and their pale-gray upper wings usually show a dark wedge on the trailing edge of the primaries. Their forked tails show dark outer edges and do not extend past their wingtips when at rest.